Half of Israelis pay no income tax: The income tax burden in Israel is relatively low for most of the country’s income deciles, with 49.7% of individuals not paying any income tax in 2011. The shares not paying any income tax were even higher in 2010 and 2012: 51.2% and 52.3%, respectively. The income tax burden spikes sharply in the higher deciles: the top income decile contributes nearly three-quarters of the country’s total income tax revenues while the top two income deciles account for almost 90% of all income tax revenues. The highest marginal income tax rate in Israel in 2012 was 48%, ranked 7th highest among the 34 OECD countries – rising to 50% in 2013. 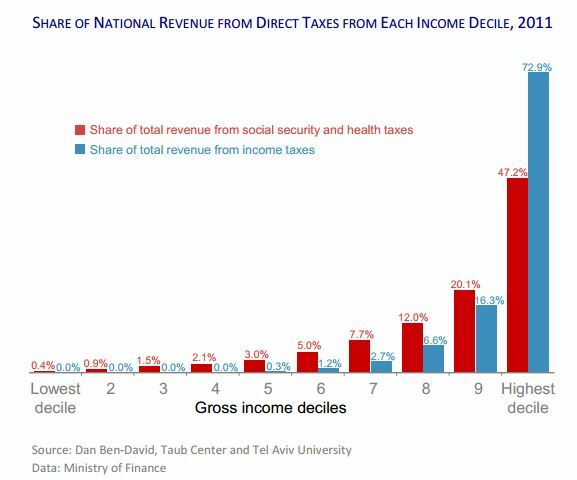 Revenues from social security and health taxes are more evenly distributed among income deciles.